Come and relax at one of the most beautiful lake frontage spots you will find with in 2 hrs of NYC. Take a magical step back in time to a simpler more tranquil place where all you hear are the birds singing their songs, the splash of the waves over the rocks and the soothing sounds of fall breezes rustling the branches of the trees. 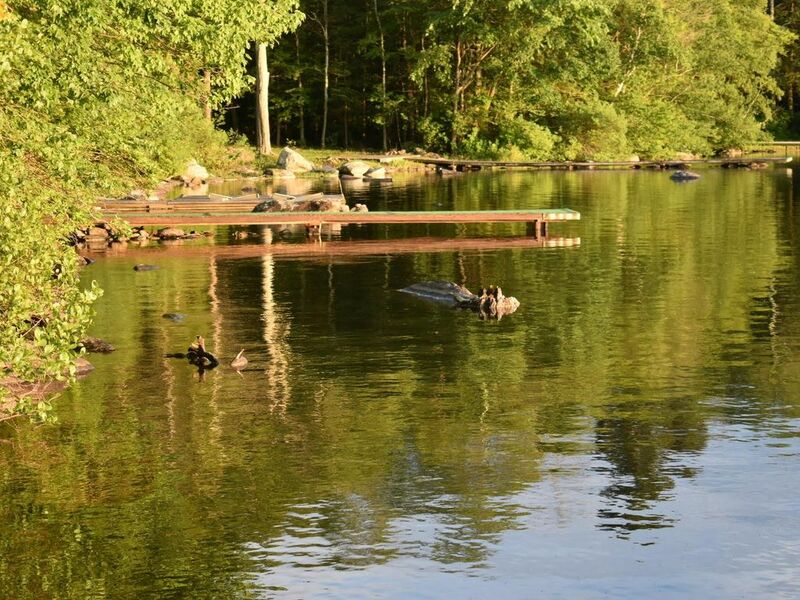 Yes, you will find all this and much more at our unique circa 1900 family camp on one of the most peaceful, cleanest lakes in Connecticut. Spring is ABSOLUTLEY beautiful here! and the Fishing is at its best too! Our unique 4 building pet friendly camp is located on the finest vantage point on the lake for sunsets. Our nearest neighbor 200' away are the nicest elderly couple you would ever want to meet. Beauty, serenity, peace are the words I would use to describe our camp. One of the most unique and charming properties you will find so close to the large urban areas in CT and NY. This one of a kind property is located on West Hill Lake, which is one of the cleanest lakes in Connecticut. The lake has an 8 horse power motor restriction, which makes it one of the most peaceful lakes and allows everyone to enjoy swimming, sailing, canoeing, kayaking, and paddle boarding safely. The lake also sustains an abundant variety of fish and is stocked by the State of Connecticut. It has Kokanee Salmon, Rainbow Trout, Brook Trout, Brown Trout, Small Mouth Bass, Blue Gill, Sunfish, Bullhead, & Pickerels; a record 16lb. Brown Trout was just caught this year from the lake. You can also fish in the Farmington river which is only 10 minutes away. It is always stocked with trout and among the top ten trout rivers in New England. We currently have a Bald eagle that is fishing from a large pine tree on the property. We have seen him the past few days fishing in the lake and pulling out trout. Amazing and beautiful to see! Our lake is on a hilltop, surrounded by hundreds of acres of lush forest of evergreens, sugar maples, and birch trees which is a spectacle to see when the fall colors come out. Outdoor enthusiasts have a lot of choices for recreation. In addition to all the different ways to enjoy the lake, there are also quiet scenic roads for road biking, shady bike paths for family riding, hiking trails , vineyards for wine tasting, golfing , award winning restaurants all within 15 minutes (just ask we know them all intimately!) or go prowling for antiques at antique malls, shops or tag sales. No wild racing speedboats and lots of swimming, sailing, and boating. The North End Store is located at the end of the lake and is just a quick ride down the road. A quaint old time store with a mini restaurant that has live music every weekend with specialty cooking to go with it. Just around the corner is a public park with playgrounds, beaches with lifeguards and tennis courts. For those who like to golf, a public golf course is located approximately 5 minutes away with others within 20 minutes. Walmart, CVS, shopping, hospital, etc are only 10 minutes away. Family camping with ease and convenience. This amazing property has three separate living spaces (main lodge, bunkhouse, dining room) the boathouse has no access to renters. All are located directly on West Hill Lake. The bunkhouse has two bedrooms and a 1/2 bath inside and a delightful new wooden enclosed outside shower! The outside shower has loads of hot water provided by a brand new over- sized hot water heater that provides a one of kind tantalizing experience. All buildings have baseboard electric heat.. The bunkhouse has two freshly painted bedrooms with all new bedding, brand new sheets and pillows .Bedroom 1 has a full bed and Bedroom 2 has two twin beds. The Dining Room is an absolutely adorable eat in kitchen It comes fully equipped with a microwave, toaster, electric stove and refrigerator and all cooking and eating utensils. Though there is no hot water in the sink we offer loads of cool deep well water which tastes like heaven in a cup! The dining room opens onto a spacious deck with a picnic table, newer stainless steel grill and a spectacular views of the lake. The "Main Lodge" is warm spacious and charming as could be. Open the doors and the whole space feel like one large outdoor porch. The lodge has two couches, large 50" screen cable TV and a working fireplace. As you walk onto the large screened in porch you can view sunset while you sit practically right on the water. Relax and take it all in. On the porch you will feel those cool summer breezes and 180 degrees of spectacular lake views. As you stroll down to the large private waterfront deck and dock you can relax with a drink in the two outdoor chairs or enjoy the gliding love seat in front of the boat house. There are two rowboats and a canoe for your enjoyment. We cannot provide motors for the fishing boats but you are welcome to bring your own motor or boat. Fishing can be done right off the dock as well. All of the buildings are very open, clean and have spectacular views of the lake. A place of many memories. People have been making wonderful memories here for over 100 years. Come enjoy and make your own. We would love to share the opportunity with you to step back in time and discover that contentment and beauty we are so fortunate to enjoy. Camp rules....Sorry, but we do not allow smoking in the house. We also do not allow underage drinking of alcohol or drug use. No large parties. West Hill Lake is a very quiet place to visit and enjoy relaxation and recreation. We are only looking for guests who are going to be respectful of our neighbors and the property. Joe and Stacey have been in the area for over 50 years and have run a local family business for nearly 40 years. SUNSET SUNSET SUNSET!!! Peace , Serenity, Privacy! Nature at its finest! Toilet and sink inside and an outdoor shower. We spent two nights at Joe and Stacey's camp just before Labor Day -- and what an amazing place! Within an hour of arriving, we felt as though we'd been disconnected for days... The three buildings are exactly as other reviews describe. So charming and rustic, and yet everything you'd ever need. Thank you Joe and Stacey! Joe and Stacey's Camp is the perfect spot to get away from it all. We loved our week there. The camp is tucked away in a lightly wooded lakeside property. It's unique set-up, with a bunk-house, dining/kitchen building, and beautiful lodge with screened-in porch, make for an old-time camp feeling. The towering pines kept us cool and of course the clear water of West Hill Lake beckoned. What a special place camp onion is! My two young children had a blast swimming all day in the lake and my husband fished and caught some nice trout, bass and pickerel. We all enjoyed the comfy couch out on the dock and lounged and relaxed between activities. The camp has a beautiful spot in that lake that not only gets sun but some great shade for those hot summer days and we watched beautiful sunsets every night. The kids said the screened in porch felt like a treehouse! Which it did and was so cool! Everything was super clean and cozy, and well decorated. You can tell the camp has been cared for with love and it’s a great place to make family memories! We didn’t want to leave! In fact the next day my 4 year old son woke up and the first thing he told me was that he missed the lake house and the fish he had caught with his dad. Joe and Stacy were super hosts and very helpful and responsive. Would love to return! Tranquility is the perfect world to describe our experience at the lake. We did not see, nor hear the neighbors, saw beautiful sunsets every night of our stay and enjoyed spacious screened in porch after dark for family game nights. Joe was very responsive and even stopped by to help us with the grill when we could not get it going (user error :)). The only drawback for us (we had 8 people and 2 kids) was a single half bathroom located in the main bedroom. If you have a smaller group, might not be an issue. Lovely spot on one of the most peaceful lakes in Connecticut. The screened in porch is perfection! Our hosts offered many modern amenities such as excellent wifi, cable, and beautiful lighting. The window boxes were planted with fall mums and were just one of the many welcoming and homey touches. If you love the nostalgia of the old time lake camps you will love Camp Onion. We will definitely be back!